What did Jesus tell the disciples to do after He left? What did the angel promise? Verse: John 14:2 – In My Father's house are many mansions...I go to prepare a place for you. If you’re happy and you know it then your life will really show it. 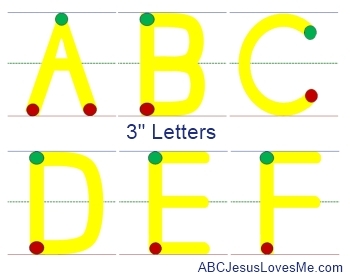 Name: Write the 4th letter of your child's last name using 3" Letters. 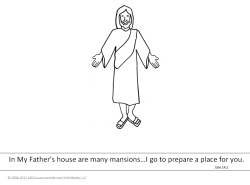 - Color Jesus and create shaving cream clouds around Jesus on the My Father's House worksheet. - Introduce ABA patterns by beading with lacing beads or by threading fruit loops onto spaghetti pieces stuck vertically into play dough. - Introduce the letters Yy using the tactile letters and decorate the Letter Poster to add to the Letter of the Week book. - The top of the Letter Y is formed by making an upside down triangle without a top. • Walk around the neighborhood or park collecting different items from nature. Use spatial words as you find things (i.e. The leaf up high...The red flower between the...) Back at home, create a poster and glue items on. 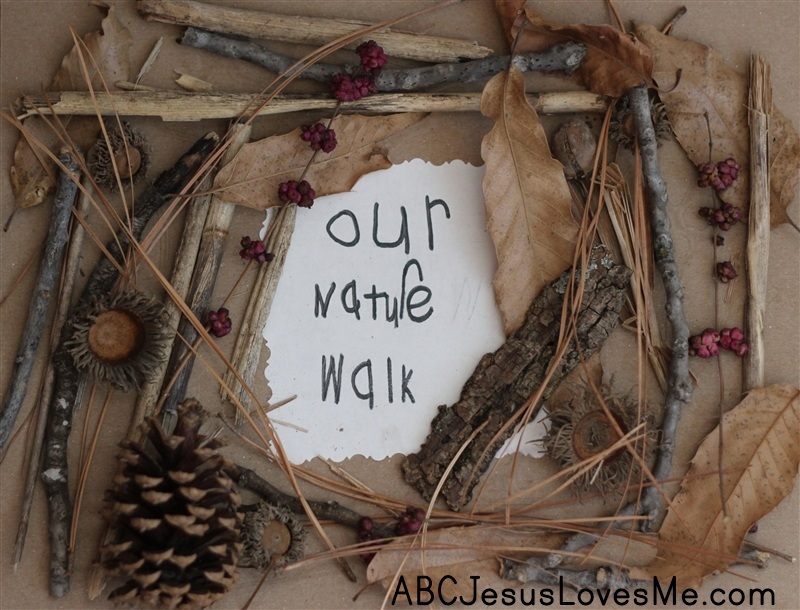 Add the title "Our Nature Walk" on the poster. Allow to dry. 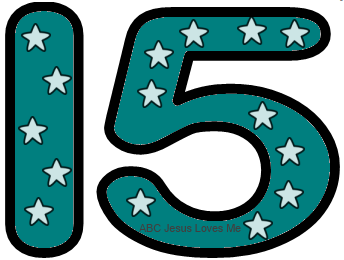 - This week decorate the Number 15 Poster with your favorite medium. Add fifteen stickers. To complete the book, add a cover page titled "My Number Book." If the child is ready, introduce the fourth letter of her last name while saying the Letter Formation Chant. _____, _____, they both say _____. For example - Sheep, jeep, they both say -eep. 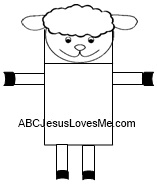 - Cut out the pieces of the Lamb Puppet worksheet. Glue the head to the bottom of a white paper sack. Glue legs to the sides and opening (be sure to glue the legs so that the hand will not cover them up). Glue the tongue inside the fold. Roll thin strips of white paper around a pencil to curl. Glue as wool on the lamb’s head. Use the lamb puppet for the "Is Jesus Gone?" story written below. Using shallow cups, write a number (0-15) on each cup. 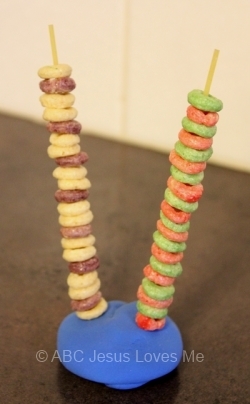 Have your child fill each cup with the correct number of small items (i.e. chocolate chips, buttons, coins, candy). Encourage the child to pick up each item with her thumb and index finger. Set the timer and try to put the small items into the cup in a short amount of time. Practice batting a ball using a beach ball or other large ball. The larger the ball and bat, the greater the chance of success. Point out the ABA pattern of pitcher, batter, pitcher. Adult: ______? (Puppet’s name) What’s the matter? Puppet: I just heard the news. Isn’t it sad? Adult: What news? It must be really sad – you look like you’ve been crying for a long time. Let me help you blow your nose so you can talk. (Get out a tissue and pretend to blow the puppet’s nose) Now that’s better. Adult: _______, try to stop crying so you can tell us what’s wrong. Maybe I can help you. Puppet: Well, I heard you telling the story about Jesus going back to Heaven. And I started thinking that …. (sniffs) there won’t be any more stories about Jesus. Puppet: Because Jesus is gone now. We can’t hear anymore stories about all of the great things He did. I really liked the story about Jesus calming the storm… and healing the little girl… and rising from the dead. But now I won’t ever hear them again. Adult: ______, we can still hear those stories! Puppet: (Stops sniffing) We can? How? Adult: Maybe ______ (Child’s name) can help answer that question. (To the child) How can we hear the stories about Jesus? (i.e. Bible, church, parents.) See, ________ (puppet’s name) we still have the Bible, and we have lots of grown-ups who can tell us the stories. Puppet: (Cheering up a little) I kind of forgot about that. Puppet: Oh yeah! I remember that part of the story! I better get busy on that job! I want to tell lots of people about Jesus. Let’s see… I can tell my brother, and Cousin Joey, and my friend Jimmy at school, and … I better go start telling them.